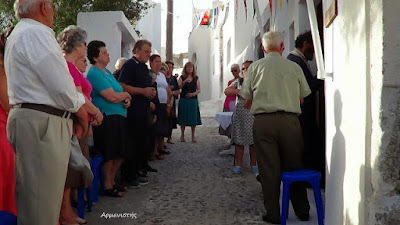 Below is the monthly review for the month of June of the ten most popular articles from the previous month on johnsanidopoulos.com, then all the posts made on the other websites of the Mystagogy Resource Center. 6. 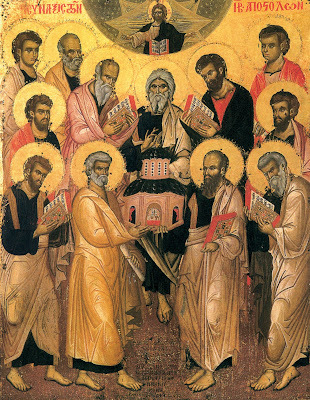 Did St. Justin Popovich Break Communion With the Serbian Patriarchate? 1. The Author of the Book "The Gurus, the Young Man, and Elder Paisios"
1. 5 - Book Review: "Occult America: The Secret History of How Mysticism Shaped Our Nation"
4. 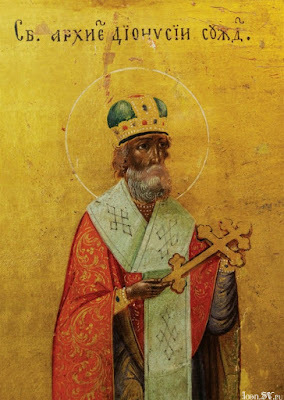 8 - Book Review: "Protestant Patriarch: The Life of Cyril Lucaris (1572-1638), Patriarch of Constantinople"
The Church of the Holy Twelve Apostles is a monument of architecture that is part of the complex of a medieval Genoese fortress in Sudak of Crimea. The Church of the Twelve Apostles is located at the base of Mount Palvani-Oba, next to Astragver Tower, its other name is the Port Tower. 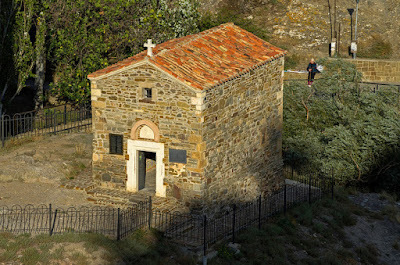 The church, built in the Byzantine style, is referred to in the Middle Ages (13th-15th centuries) as being built for the Greek community of medieval Sudak. 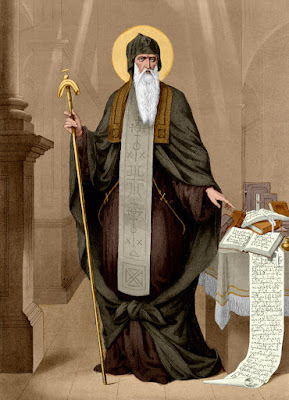 Saint Gelasius (Ghelasie) was the abbot and founder of the Ramet Monastery in Transylvania. He had lived as a solitary near Ramet Creek, and he was granted the grace of working miracles. 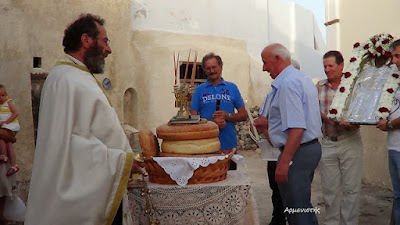 The Saint fasted on weekdays, eating only on Saturdays and Sundays, and his only food was the Divine Eucharist. During the day he fulfilled his monastic obediences, and at night he kept vigil. 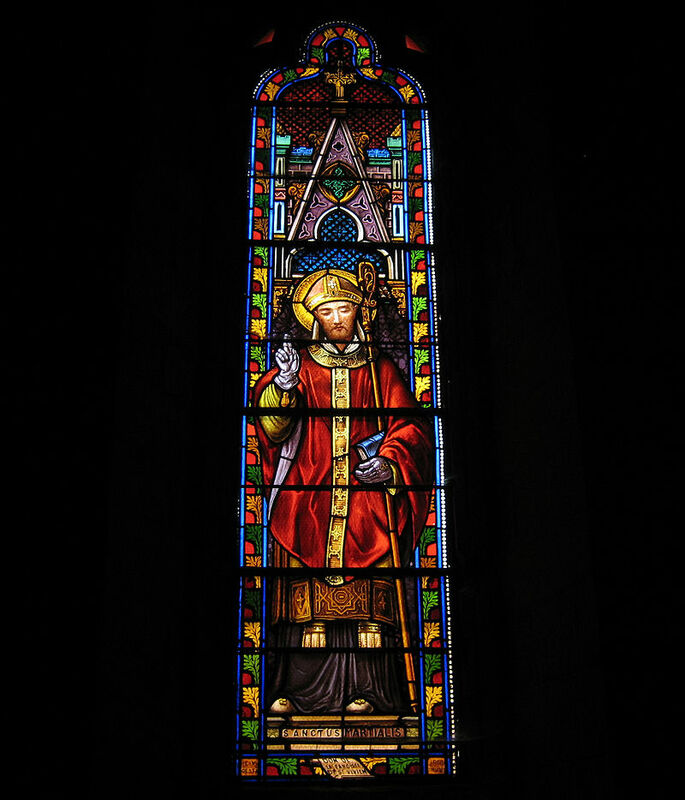 Saint Gregory of Tours names Saint Martial, who founded the Church of Limoges in France, as one of the seven bishops sent from Rome by Pope Fabian to Gaul with Saint Denis of Paris in the middle of the third century. 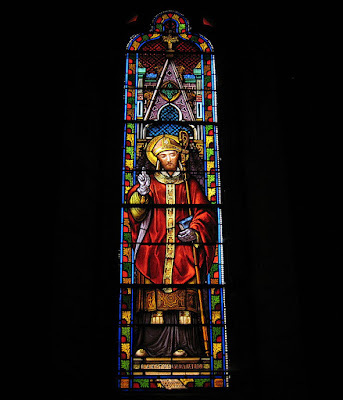 At Limoges he overturned pagan worship and superstitions and filled the city with faith in the true God. 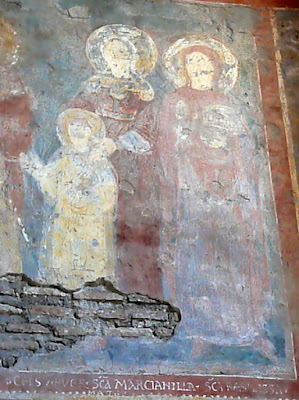 He further writes in his History of the Franks: "Martial lived in the greatest sanctity, winning people to the Church and spreading the faith of Christ among all, and died in peace, confessing the faith." 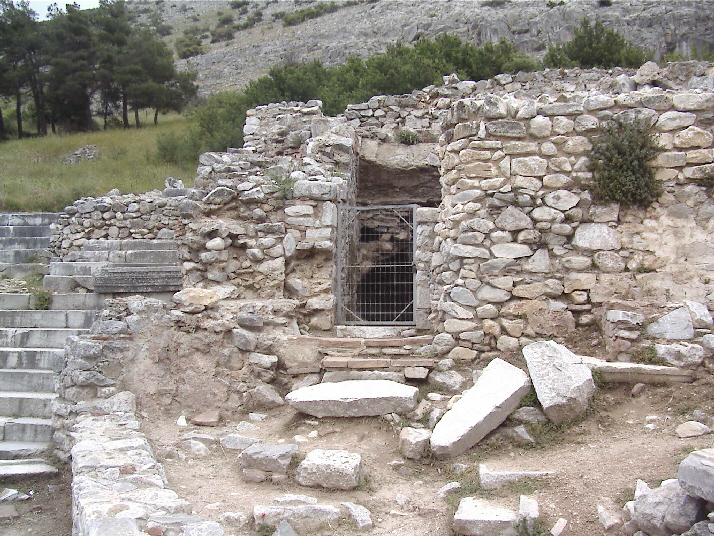 Philippi, where Paul and Silas spent time in a jail cell, was a city in eastern Macedonia established by King Philip II of Macedon. 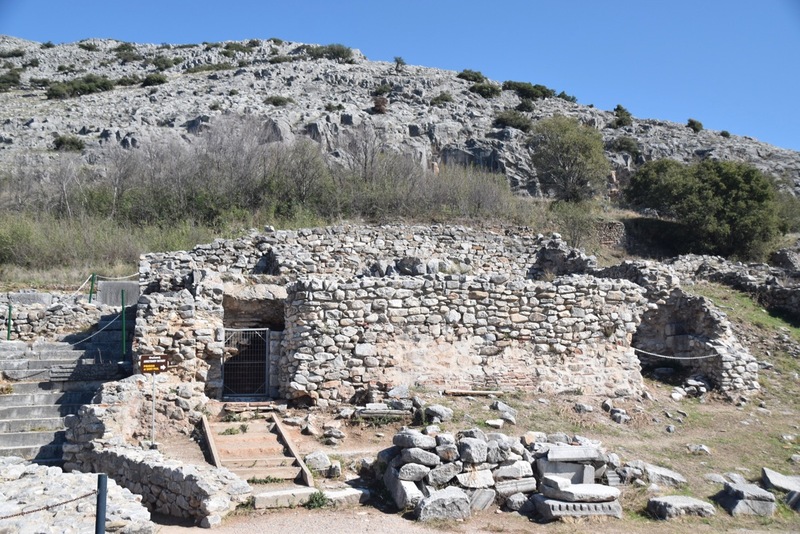 The king started the city in 356 B.C., the same year his son and heir to the throne Alexander III (also known as Alexander the Great) was born. The objective of founding the town was to take control of the neighboring gold mines and to establish a garrison at a strategic passage. 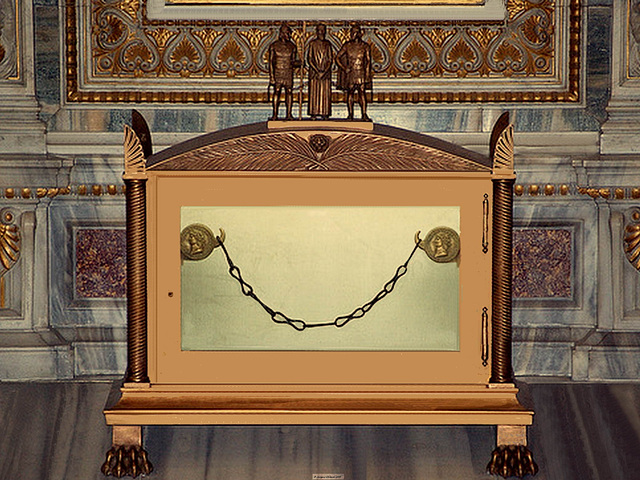 In the Basilica of Saint Paul Outside the Walls in Rome, the chain that, according to the most ancient tradition, attached the Apostle Paul to the Roman soldier assigned to guard him while in prison in Rome, is the most precious among the relics and objects on display in the Chapel of Relics. 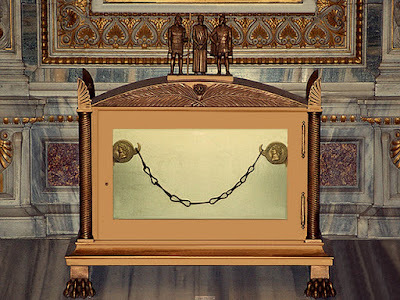 On the Feast Day of Saint Paul (June 29th) each year, the chains are taken in procession around the Basilica. Saint Cassius was Bishop of Narni in Cascavel from 9 October 536 to 29 June 558. 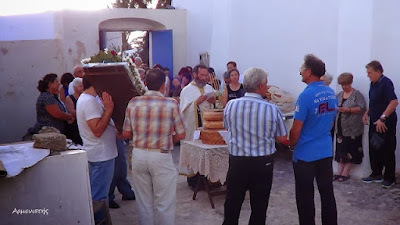 Cassius was married; his wife's name was Fausto. He was most noted for his daily celebration of the Liturgy and the giving of all his possessions to the poor. 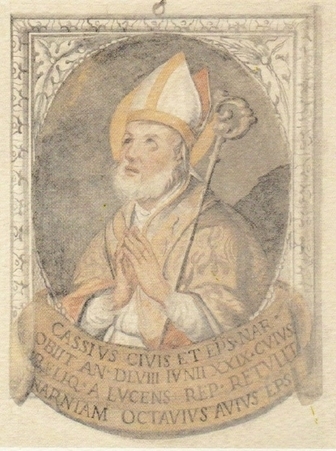 Cassius's time in office coincided with Justinian's Gothic War, a dangerous period for Italian cities. 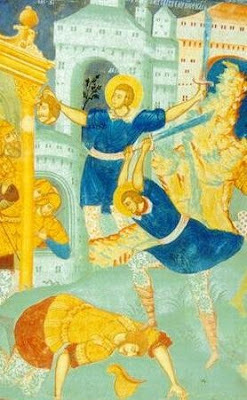 and Paul to the sword. 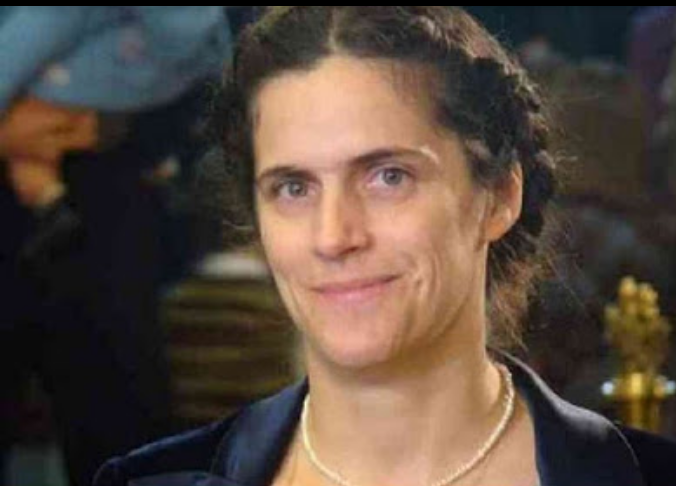 A brave Martyr of the Lord? He flourished during the reigns of Emperors Diocletian and Maximian in the year 301, having adored and believed in Christ from his ancestors, and he proclaimed piety to others. For this he was accused before the governor and apprehended. Thus he stood before him, and he was urged to sacrifice to the idols. Because he could not be persuaded, but instead he insulted the governor, for this the governor became enraged. There he died, like Moses on the mountain. 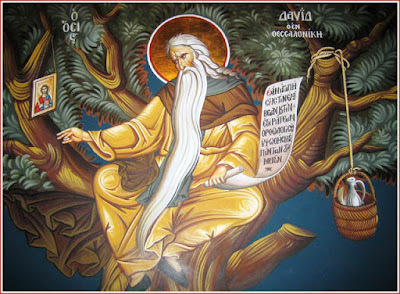 In his Synaxaristes, Saint Nikodemos the Hagiorite informs us that the Moses commemorated on June 28th is not the Ethiopian, because he is commemorated on August 28th, therefore it is believed that the Moses referred to on this day is the Moses that Saint John Cassian spoke with, their conversation being recorded in the first two books of the Conferences. 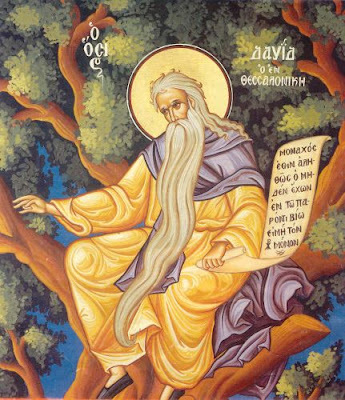 We know that this Moses is not the same Moses as the Ethiopian, because he specifically says in this text that Moses entered the desert monastery in his youth. 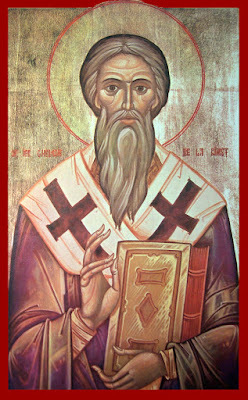 Below is the complete text of the first two conferences recorded by John Cassian. You have the same amount of athletes by the sword. Almost nothing is known of these Holy Martyrs. 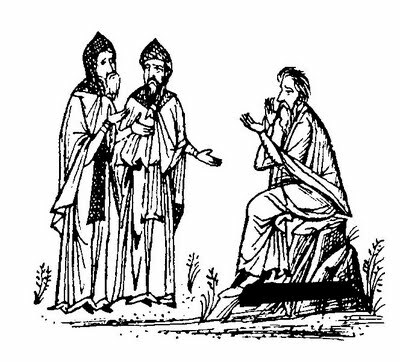 Basil was either the leader of the Seventy or one of the Seventy and probably a native of Scythopolis. They were martyred by the sword, probably by beheading, in Scythopolis (mod. Beit Shean; Baishan in Syriac) of Palestine. Basil is separately commemorated on July 5th, the day of his martyrdom, while the Seventy are all together celebrated on June 28th. 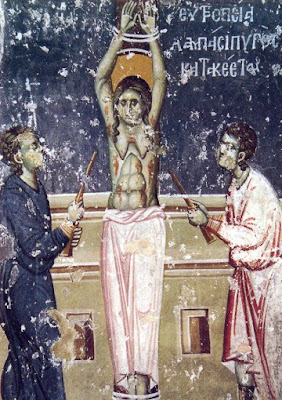 Interestingly, Saint Prokopios of Scythopolis was martyred in Caesarea on July 7, 303, according to Eusebius, and he was the first martyr of Diocletian's persecution there; perhaps there is an association. along with his fellow contestant. This is an old church, but the internal and external embellishment of the church dates to 2003. It is one of two churches in Santorini dedicated to Saint Sampson, and one of seven dedicated to the Saint in all of Greece. 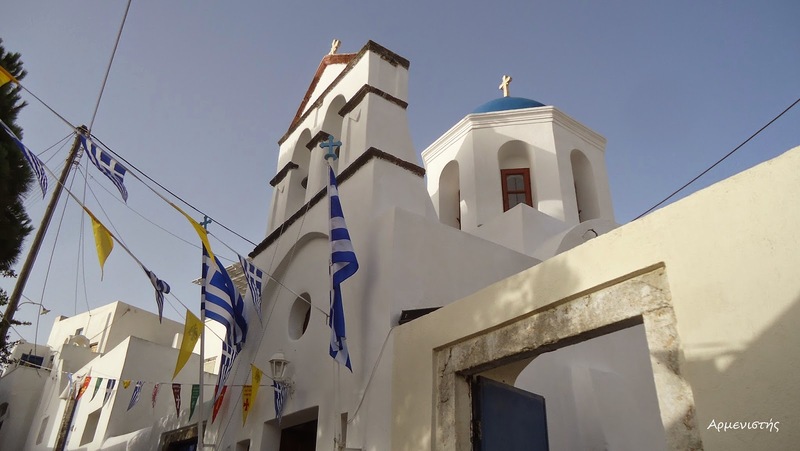 The church is located near the Elementary School on the eastern side of the village, along a narrow path. It also celebrates on August 27th, when locals bake Phanouropita in honor of Saint Phanourios. Saint George’s family had its roots in the region of Samtskhe in southern Georgia. George was born in Trialeti to the pious Jacob and Mariam. 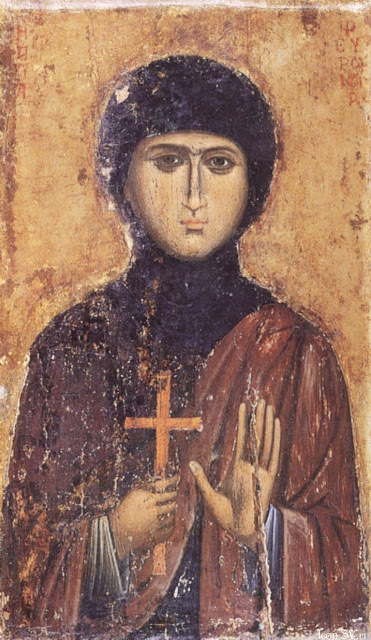 When George reached the age of seven, the God-fearing and wise Abbess Sabiana of Tadzrisi Monastery in Samtskhe took him under her care. 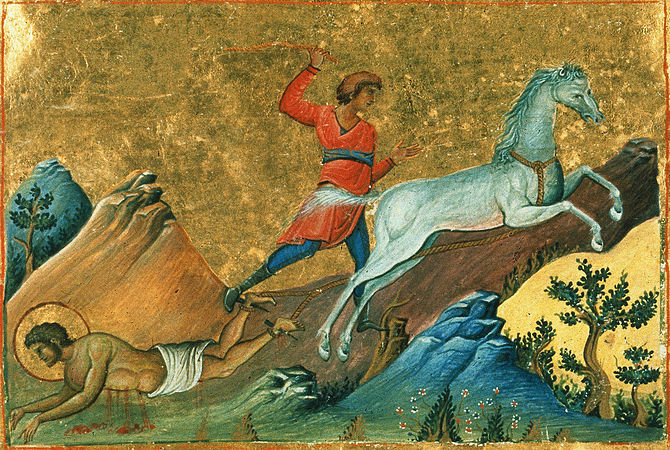 George spent three years at Tadzrisi, and when he was ten his father sent him to Khakhuli Monastery, to his own brothers Saints George the Scribe and Saba. 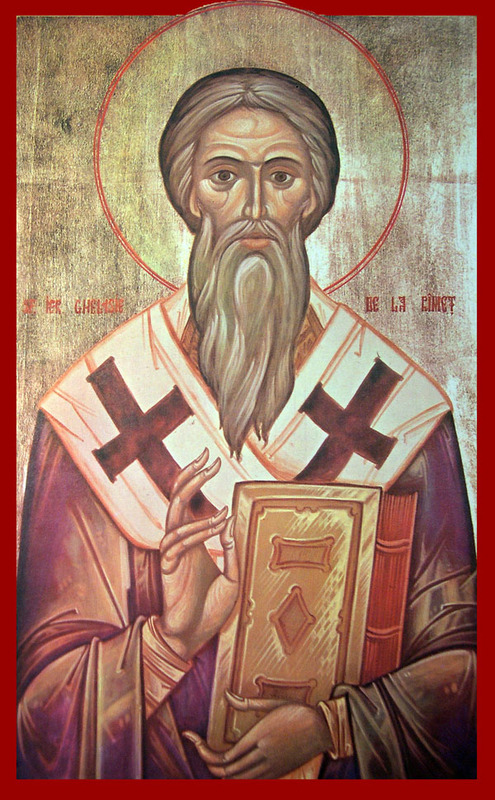 Cyril Loukaris was elected Ecumenical Patriarch of Constantinople in 1620, at a critical time in Europe. The Thirty Years War (1618-1648) between Catholics and Protestants was raging, exporting its hatred and violence to the East. 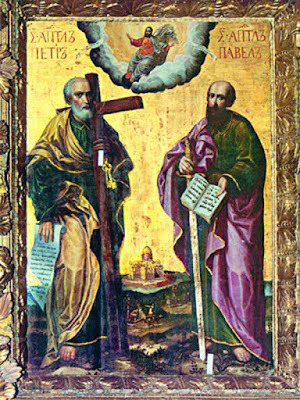 Jesuits and Capuchins were attempting to induce mass conversions to Catholicism from among the Orthodox population, while Catholic powers and Protestant ambassadors were both applying pressure on the Sublime Porte. 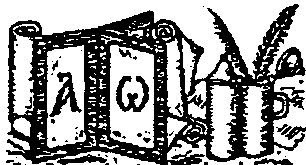 On the twenty-seventh Sampson died and gushed forth myrrh. 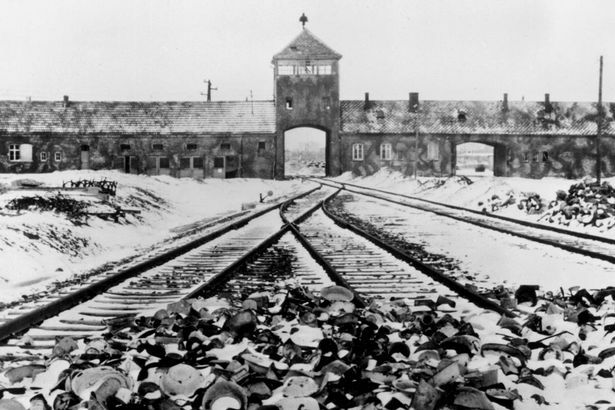 In our days words like "Nazi" and "Concentration Camp" are used in a very ignorant fashion, especially by those in America who stand on the political left, which leaves me with the understanding that they have no clue what a Nazi or Concentration Camp was. 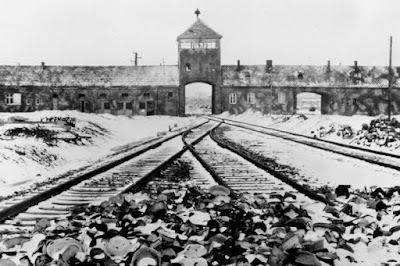 On the other end you have holocaust deniers, who I would consider to possess the same ignorance. This has prompted me to write this brief article on a day I once spent with a holocaust survivor, and what he told me about his ordeal. 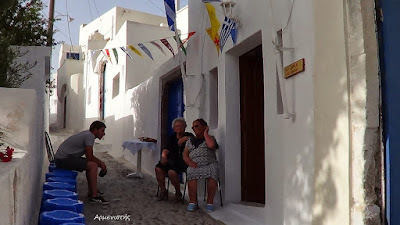 "Theoleptos, the truly great luminary of Philadelphia, flourished during the reign of Andronikos II Palaiologos, around the year 1325. He first lived the solitary life at the Holy Mountain, and from there received the dignity of Primate of the Metropolis of Philadelphia. Saint Gregory (Palamas) the Archbishop of Thessaloniki was his guide and mystagogue in lessons of excellence. 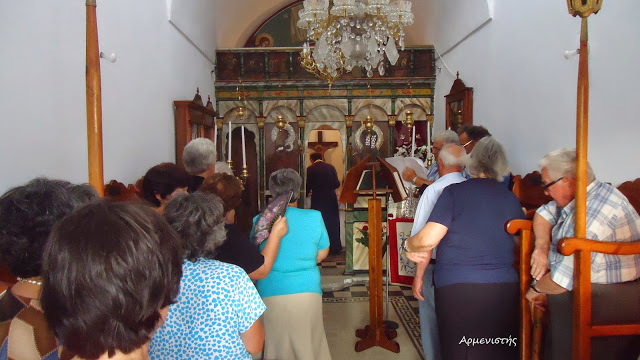 He initiated him in sacred watchfulness and noetic prayer, although he still lived in the world, as is written in the life of Gregory written by Patriarch Philotheos. 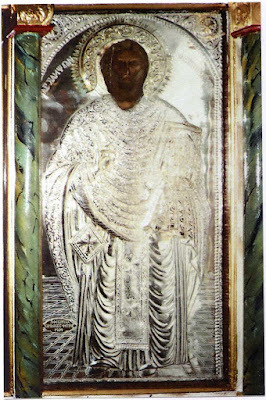 Dionysius, Archbishop of Suzdal, in the world David, was a native of the Duchy of Kiev and tonsured at the Kiev Caves Lavra with the name Dionysius and made a Hieromonk. He arrived at the Volga with an icon of the Mother of God that he had received as a blessing from Saints Anthony and Theodosius. Saint Dionysius dug out a cave not far from Nizhni-Novgorod and struggled in total solitude. 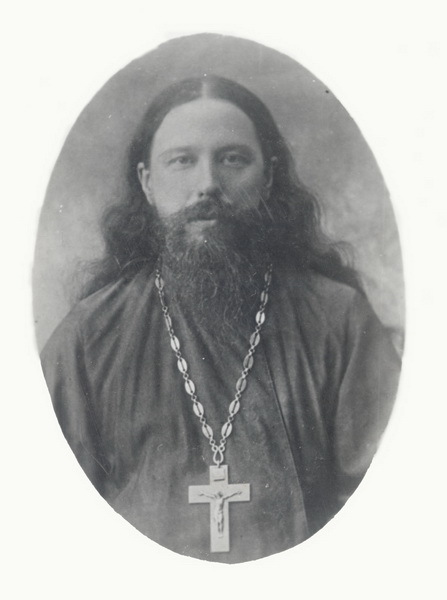 Brethren constantly thronged to the holy ascetic and in the year 1335 he founded a monastery in honor of the Ascension of the Lord known as the Pechersky Monastery. On the twenty-sixth, David passed through the gates of life. 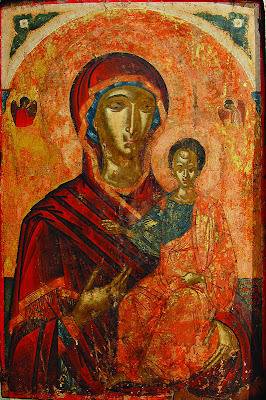 Mother of God of Lydda or "the Roman"
For thou didst kill the carnal passions like Goliath. He died on the earth and hastened towards heaven. Raised to the grounds of the house of the Lord. To which you have gone up rejoicing. The King of Angels sits. God established equal in honor to the Angels. 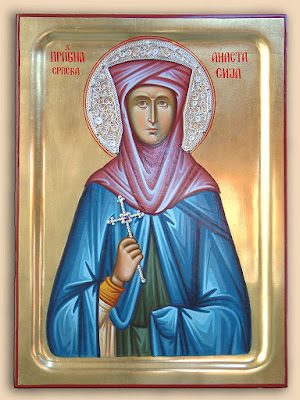 Saint Febronia is reputed to have been a martyr in Nisibis under Diocletian (284-305), and is said to have been the work of a fellow nun of her from her monastery named Thomais. The psychological insight into the friendship between the widowed Hieria and the young nun Febronia would seem point to a woman as the author. There can be little doubt that the work was composed in Nisibis, which is in the Mardin Province of Turkey, bordering Syria. Her veneration appears to have become popular only in the late sixth century and later. In the verse Life of the East Syrian monk Rabban bar 'idta, we are told that in 563 his sister "built a nunnery in the name of the martyred woman Febronia who had been martyred in the days of Diocletian;" this convent was not in Nisibis itself but across the Tigris in Marga. 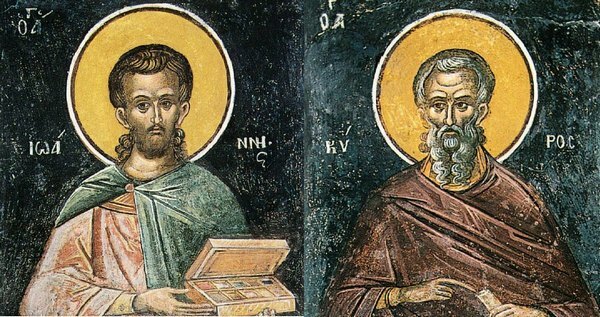 In the seventh century the veneration reached Constantinople, where it be­came associated with that of Saint Artemios, and it is probably of significance that the emperor Heraclius (610-41) had a daughter (by his second wife Martina) named Febronia. 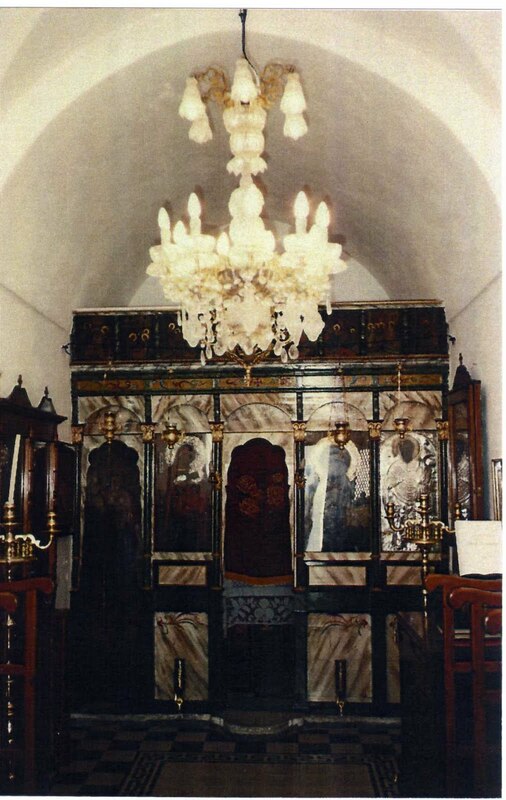 Saint Febronia also had an oratory in the sanctuary of the famous Church of Saint John the Baptist in the Oxeia Quarter of Constantinople. It would seem plausible to suggest that the veneration and the Greek translation of her Life reached Constantinople at much the same time. Once in Greek, her Life served as a source for several later passions. 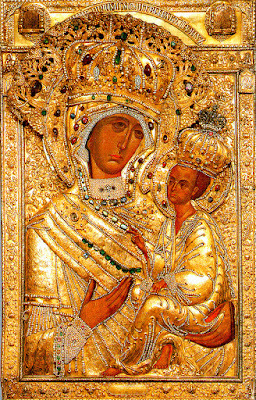 From the capital her veneration spread to Italy (by way of Naples) and France. The dwelling place of his spirit is the heavens. 1. A magistrate came to see Abba Simon one day. When he heard of it, he put on his apron and went out to attend to a palm-tree. When the visitors arrived they called out to him, ‘Old man, where is the anchorite?’ He replied, ‘There is no anchorite here.’ Hearing these words, they went away again. Prince Peter was the second son of the Murom prince Yuri Vladimirovich. He entered upon the throne of Murom in the year 1203. 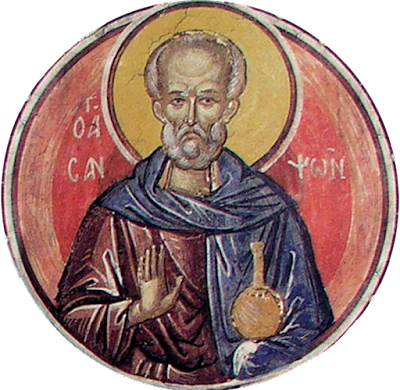 Several years before this Saint Peter had fallen ill with leprosy, from which no one was able to heal him. In a vision it was revealed to the prince that the daughter of a bee-keeper would be able to heal him: the pious maiden Febronia, a peasant of Laskova village in Ryazan gubernia. Saint Peter sent his emissaries to this village. On the twenty-fifth Febronia gave her neck to the sword. 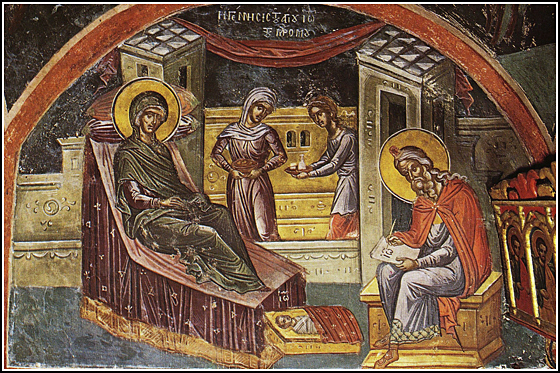 The mother bore the Forerunner on the twenty-fourth. Not with many children, but with one great one. 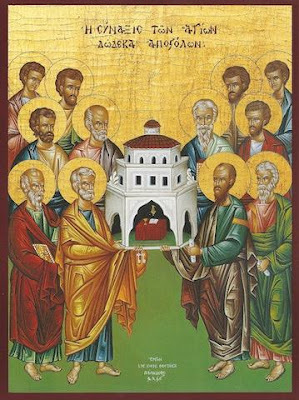 The fast of the Apostles was established in their honor, and rightly so for through them we have been deemed worthy of many good things, having been made manifest to us as practitioners and teachers of fasting and obedience, even unto death itself persevering in self-control. 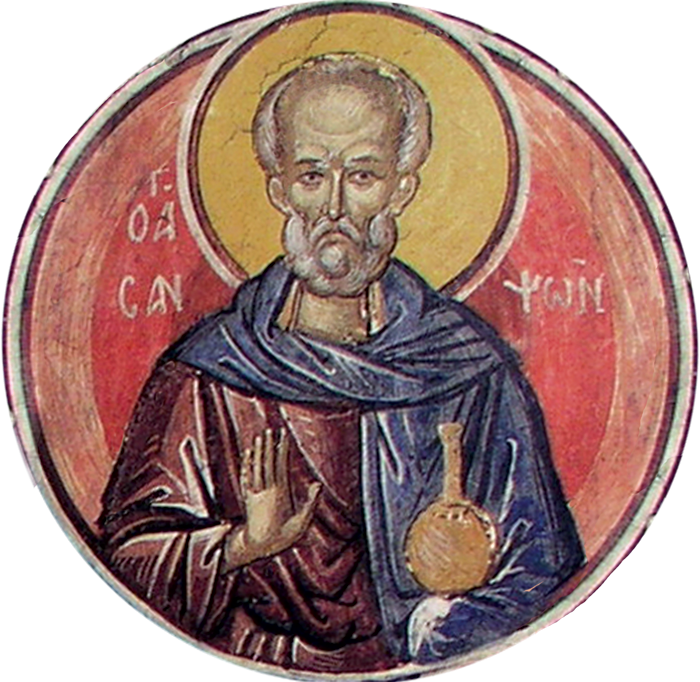 To this even the Latins bear witness unintentionally, honoring the Apostles on the days of their memorials with fasting; but we, in adhering to the Apostolic Constitutions compiled by Clement,* after the Descent of the Holy Spirit rejoice for one week and then, immediately after, we fast for a week, that we may not grow weak through soft living, as we are taught. At the same time we honor through fasting the Apostles who enjoined fasting. Keeping in mind the One who crowns. Though beheaded by the sword his soul remains unwounded. As a bride you were painted rouge with your blood. Rejoicing Probis as you advance towards Christ. Making no sound like a sheared lamb. Saint Anastasia was the mother of Saint Sava of Serbia (Jan. 14). She came from a noble family, though her origins are unknown, and received the name Anna when she was baptized. 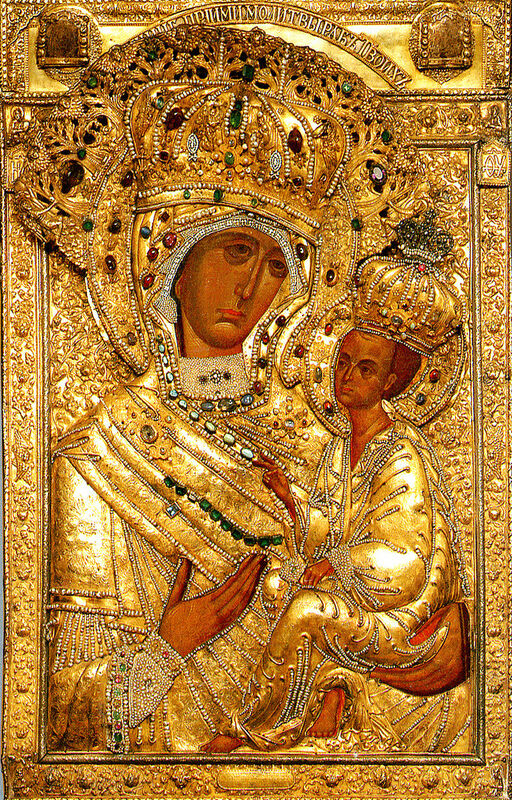 Later, she married the Serbian Grand Prince Stefan Nemanja (Sept. 24), making her the princess consort of the Serbian Principality around the year 1150. 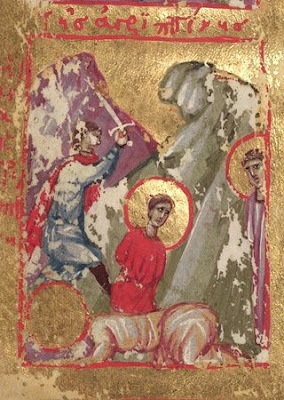 On the twenty-second the head of Eusebius was crushed. 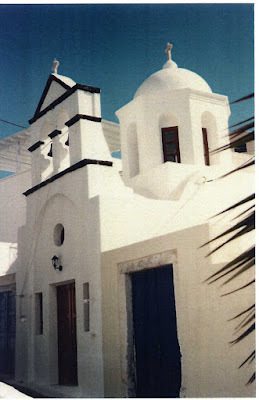 St. Basilissa. The boy is Marcianilla's son, St. Celsus, chained to St. Julian. 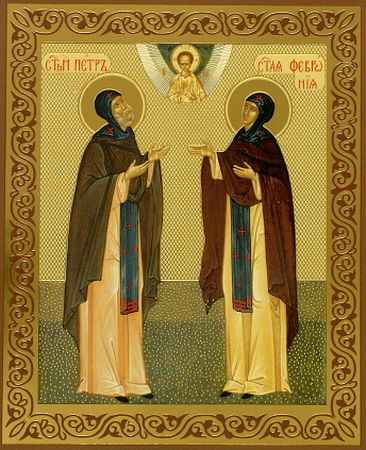 There are two pairs of saints that have come down to us as Julian and Basilissa, and probably based on the same people. One pair is celebrated on January 8th and the other on June 21st. The reason they can be identified as the same pair is because they are both commemorated with three other martyrs named Celsus, Anastasios and Anthony, and the resemblances are too close to deny. By your death you found a blessed beginning. 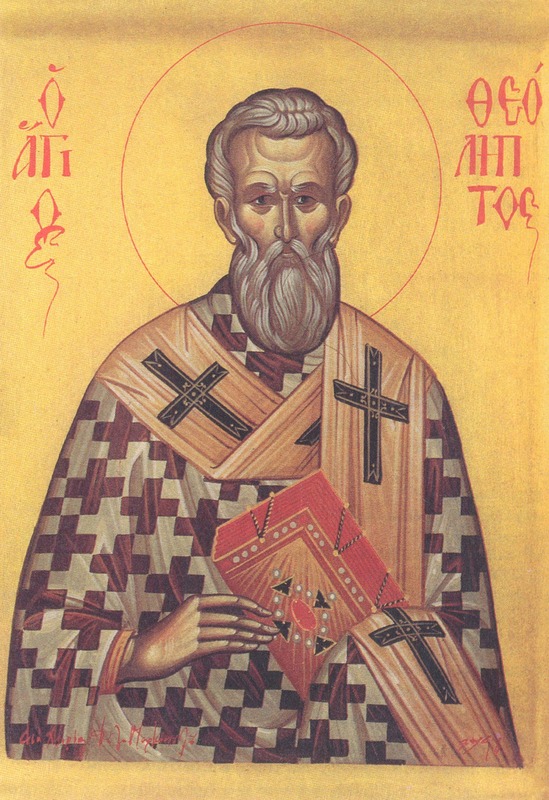 Terence, also known as Tertius or Terentios, was the second bishop in succession after Saint Sosipater (Nov. 10; Apr. 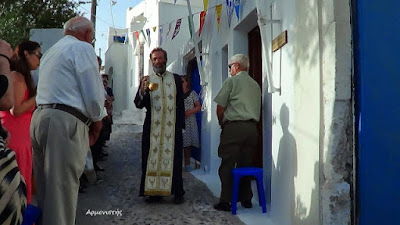 29) in Iconium, where he converted many pagans to Christ through his words and deeds done in the power of the Holy Spirit, also baptizing those converted by Saint Sosipater.